Parasol unit foundation for contemporary art is pleased to present an exhibition of important works by the British Palestinian artist Mona Hatoum. The exhibition will present works as yet unseen in London that cover more than a decade of Hatoum’s career. Including large-scale installations, sculpture and works on paper, this exhibition illustrates the scope of Hatoum’s varied artistic practice that, through residencies and travels, draws its influence and materials from very different cultures and locales. The works in this show were made in places as diverse as Cairo, Stockholm, Jerusalem, rural France and a shaker community in North America. 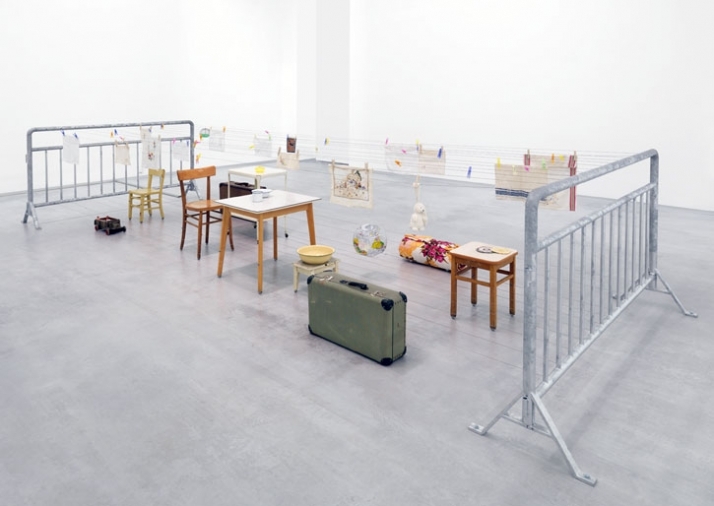 In the course of her international career, Hatoum has created works in a variety of media, including performance, video, photography, sculpture and installation. Her works are rooted in notions of displacement, uncertainty and power structures, themes that are addressed through the use of familiar, everyday domestic objects transformed into foreign, uncanny things. Hatoum’s practice also deals with issues related to the making of art and, in particular, with questions about the inherent physicality of sculpture as well as our relationship to the formal concerns of space and material. two-metre-square carpet, fringed with light-bulbs which illuminate and fade with a mesmerising melancholic pulse, hinting at an ever-present threat to stability. 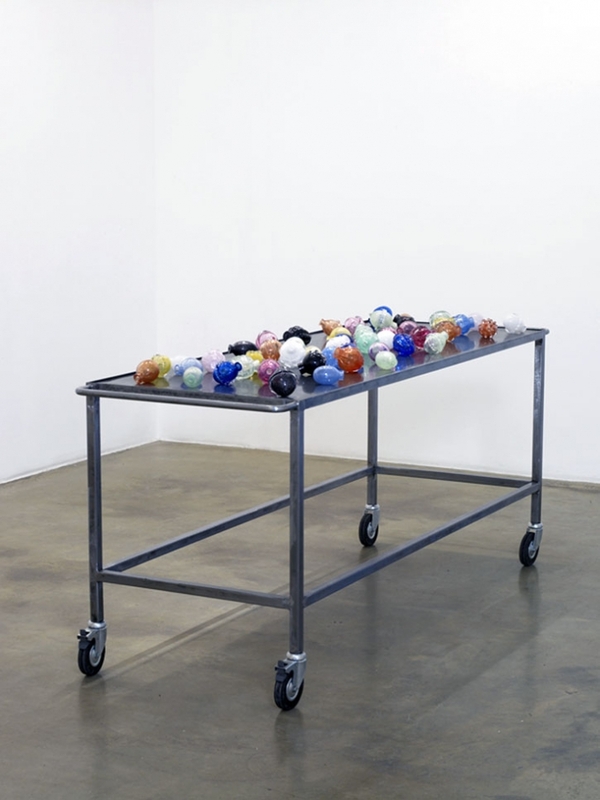 Notions of violence are similarly referenced through the sculpture Nature morte aux grenades, 2006-2007, in which a collection of colourful crystal shapes resembling hand grenades are placed on a steel trolley. The contrast between the bright, confectionary-like colours of the shapes and the subtext of danger highlights the duality of Hatoum’s approach, blurring the distinction between subject and context in a disturbing manner. Another work on show is Present tense, produced during a residency in Jerusalem in 1996. A floor piece, Present tense is made out of blocks of local olive oil soap with red glass beads imbedded into its surface, delineating the outline of the map of the Oslo Peace Agreement between Israel and The Palestinian Authorities. Since making this work, Hatoum has frequently used the map as a motif in her practice, most recently through a process of material-removal. In both Projection (cotton), 2006 and Baluchi (blue), 2008 the ground appears to have been eroded or dissolved away, leaving a negative space in the form of the ‘Peters Projection’ world map, an image that depicts an accurate distribution of land mass in its true proportions, as opposed to the more common maps drawn from a Western-centric perspective. Mona Hatoum was born in Beirut, Lebanon in 1952. She came to the UK in 1975, where she remained following the outbreak of civil war in her homeland, studying at Byam Shaw School of Art and Slade School of Art, and now divides her time between London and Berlin. Hatoum’s career has seen solo exhibitions at museums worldwide including Centre Pompidou, Paris (1994); Museum of Contemporary Art, Chicago (1997), which toured to the New Museum of Contemporary Art, New York; Museum of Modern Art, Oxford and Scottish National Gallery of Modern Art, Edinburgh; Castello di Rivoli, Turin (1999); Tate Britain, London (2000); Hamburger Kunsthalle, Kunstmuseum Bonn, Magasin 3 Stockholm Konsthall (2004); Museum of Contemporary Art, Sydney (2005); and group exhibitions such as The Turner Prize (1995); Documenta 11, Kassel (2002); Venice Biennale (1995 and 2005) and The Biennale of Sydney (2006). Her work is held in collections across the world including Tate, London; Centre Pompidou, Paris; British Council, London; The Museum of Modern Art, New York; and Los Angeles County Museum of Contemporary Art. 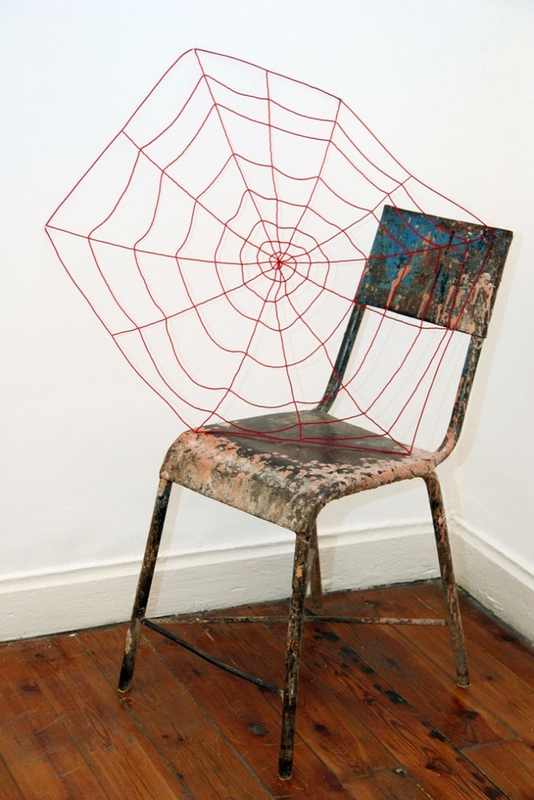 Hatoum was nominated for the Turner Prize in 1995. In 2004 she was awarded the Roswitha Haftmann Stiftung Prize (Zurich) and became the first visual arts recipient of the prestigious Sonning Prize (Copenhagen). From Angel tube, turn left out of the station and onto City Road. Continue down City Road for ten minutes and turn left onto Wharf Road before the Texaco Service station. From Old Street Tube, leave the station from exit 1 and walk up City Road for five minutes. Turn right onto Wharf Road after the Texaco service Station. Buses 43, 205 and 214 all travel down City Road.